KOHNO & KOHNO is a full-service IP law firm with more than 50 staffs including 13 patent attorneys and 5 technical engineers with Ph.D. in Osaka, Tokyo and Kyoto. We strive to be a firm of first choice for clients seeking sophisticated, high-value IP services nationally and globally. 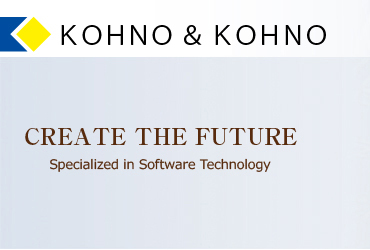 While KOHNO & KOHNO offers an extensive range of IP services, our core areas of practice are patent prosecution for software, electronics and mechanical fields and IP litigation. The firm has a uniquely flexible culture that fosters partnerships with our clients. We can not only provide a law and technical knowledge, but also provide a business strategy to achieve maximum IP values and cost effective solutions for our clients. We have earned a reputation for being trusted business advisors, and we demonstrate our value every day in the successful results we achieve. If consultation is necessary for obtaining patents, or any assistance is required to deal with issues, for example, risk of patent infringement when joining in new business fields, establishment of new trademark or how to cope with sudden warning letters, please feel free to contact us through this website. We are sure to satisfy you with our over 43-year experiences. Copyright (C) KOHNO & KOHNO All rights reserved.